MS and MPH students in the Industrial Hygiene program must complete a Culminating Experience that most often takes the form of a small research project. PhD students conduct larger research projects that produce a dissertation and manuscripts that are submitted for publication to technical journals. Students may conduct research that is laboratory-based or field-based, or some combination of the two. The Industrial Hygiene Laboratory, shared by the IH core faculty, occupies 2,500 sq. ft. and is equipped with the latest instrumentation for measurement of gases, vapors, particulate matter, biological aerosols, noise, radiation, and hazardous materials. The lab consists of a large room occupied by a wind tunnel, a filter tester, and two biological safety cabinets; a smaller room with a walk-in exposure chamber and two laboratory hoods; a wet-chemistry laboratory with work benches and another lab hood; and several smaller work, storage, and office spaces. For aerosol research and measurements, the IH Lab has condensation particle counters for measuring nanoparticle concentrations, nephelometers for measuring aerosol mass concentrations, diffusion chargers capable of measuring surface area concentrations, instruments for measuring particle size distributions, samplers for collecting biological aerosols, and numerous gravimetric samplers and cascade impactors. To analyze filter samples, microbalances and microscopes are present. The IH Lab owns equipment for gas and vapor sampling, including direct reading instruments for measuring ammonia and hydrogen sulfide concentrations and concentrations of organic vapors. The lab also has typical industrial hygiene devices such as flow calibrators, sampling and vacuum pumps, Dräger pumps and tubes, noise dosimeters, velometers, manometers, pressure gauges, pitot tubes, and centrifugal fans. Equipment is available for generating different kinds of gases, vapors, and aerosols for experiments. The Exposure Science and Sustainability Institute (ESSI) in the University of Minnesota Division of Environmental Health Sciences was founded in 2015 by Dr. Susan Arnold and Dr. Gurumurthy Ramachandran to provide excellence in Exposure Science and Sustainability research and training, responding to industry identified needs. Through ESSI, faculty and students conduct applied research to help industry answer practical questions. They generate the data to support data-driven exposure and risk management decision making, facilitating world-class product stewardship, and conduct training to ensure practicing IH and EHS professionals have the knowledge and skills they need to succeed. Through the use of the state-of-the-art full-size exposure chamber and instruments, they can measure a broad range of chemical agents and exposure scenarios for companies and industry groups, and they also conduct field surveys and assessments, providing companies and communities with exposure assessment information and health risks. Workers involved in recycling automobile components may receive harmful exposures to airborne nanoparticles emitted from the nanocomposite parts as they are shredded for recycling. MPH student Jessica Ingraham and Dr. Raynor evaluated particles generated as a granulator shredded nanocomposite test plaques. Performed in conjunction with Argonne National Laboratory and the US Council for Automotive Research, the study suggested that recycling of nanoclay-reinforced plastics is unlikely to generate more airborne nanoparticles than recycling of conventional plastics. MS students Joe Hexum and Ning Lee and MPH student Rebecca Burton worked with Drs. Ramachandran and Raynor on projects to understand how to control exposures to airborne mouse urine protein (MUP) among workers who transfer research mice between cages and dump bedding from dirty cages. Exposures to MUP can lead to severe allergic reactions. This work indicated that biosafety cabinets and clean benches are not sufficiently protective for workers during cage changing, and respiratory protection should be required for animal care staff even while using biosafety cabinets. PhD students Jooyeon Hwang and Tran Huynh and Drs. Ramachandran and Raynor measured worker exposures to elongated mineral particles (EMPs), respirable dust, and silica in six taconite mines in northern Minnesota. The results are being used for an epidemiological study of mesothelioma, lung cancer, and silicosis in taconite workers. 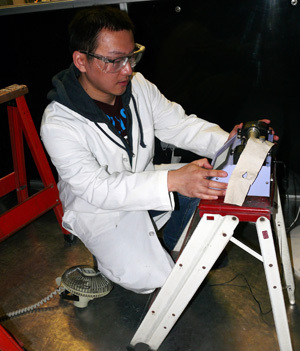 MPH student David Liverseed and Dr. Raynor conducted research at 3M Company to understand the differences in particle emissions between a conventional random orbital sanding system and a self-generated vacuum random orbital sanding system with an attached particle filtration bag. Particle concentrations were measured for each system in a controlled test chamber. Depending on the substrate being sanded, concentrations were between 300 and almost 5000 times greater for the conventional system than the vacuum sanding system. PhD student Tran Huynh and Dr. Ramachandran developed new statistical methods to analyze the inhalation exposures to several volatile organic chemicals including total hydrocarbons (THCs) and BTEX chemicals (benzene, toluene, ethylbenzene, and xylene) among oil spill clean-up workers. The results are being used in an epidemiological study being conducted by federal government researchers. The methods are also useful for analyzing data below limits of detection.